I work at a pension fund steadily losing performance chasing members (we were positioned too conservatively through the bull market) – and now the investment committee wants to be more “peer-aware”. I tend to think now is not the time to make a more aggressive allocation, but part of me also knows this kind of thinking is a form of market-timing. 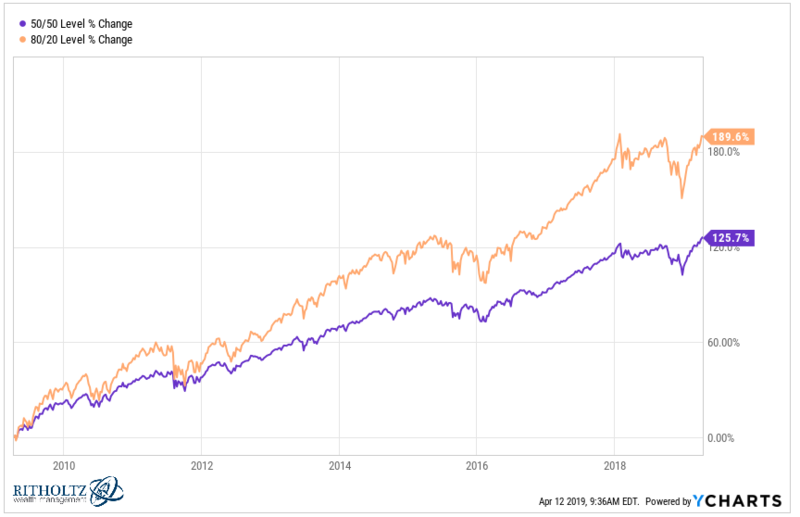 To ask the question succinctly – is changing a genuinely sub-optimal asset allocation in a value-aware way prudent risk management or just market timing in disguise? This is a question that requires a deeper dive. Anytime an asset allocation or investment strategy change comes up I like to look at it through the lens of regret minimization. 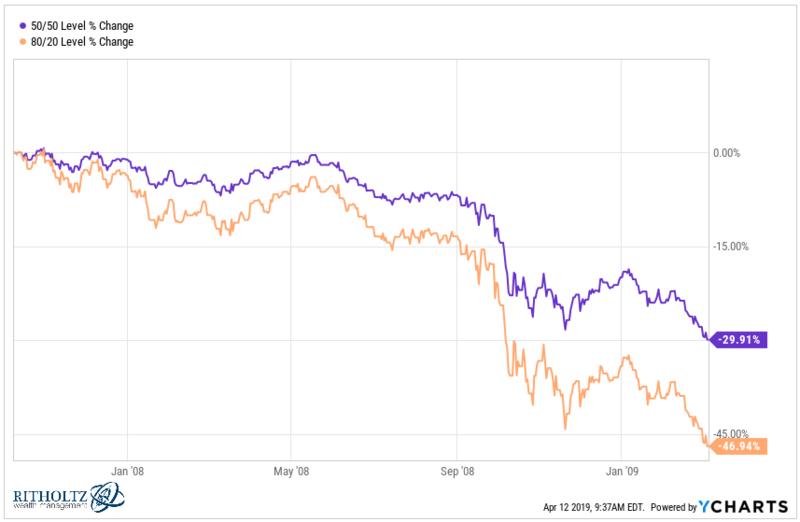 Which decision would you regret more: sticking with the status quo and the market continues to rise or making a change and the market takes a dive? Unfortunately, these decisions are often judged not by the decision-making process applied but the outcomes of those decisions. Therefore it can be helpful to run through some scenario analysis to think through this type of decision. For instance, the pension fund in question here is described as relatively defensive. Let’s use a 50/50 stock/bond portfolio as a simple proxy for a defensive position. Making a 30% strategic shift in your asset allocation could lead to two wildly different outcomes depending on the market environment. Going from 50/50 to 60/40 is a much different proposition than going from 50/50 to 80/20 (or vice versa). Most investors are probably better off completely ignoring market conditions and simply using their willingness, ability, and need to take risk as their guiding light when making portfolio management decisions. But this may be much harder to do for an institution that was misallocated for some time. 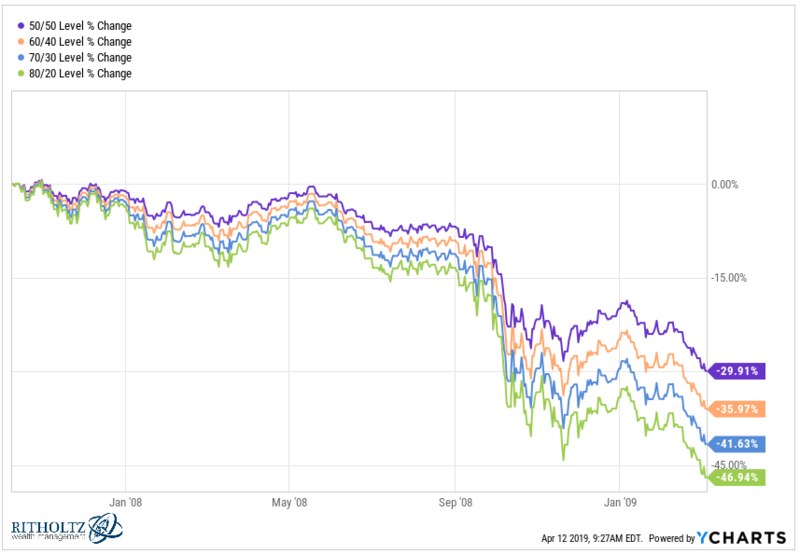 There’s never going to be a perfect time to make a change to your portfolio’s asset allocation because no one is good enough to time these moves perfectly. Door Number 1: Ripping the bandaid off may prove to be the right decision. Or it could cost you big time if the markets crash. Door Number 2: Proceeding slowly and methodically by making changes in a stairstep fashion may prove to be the right decision. Or you could leave some money on the table if markets continue to rise. Door number 1 would be for the risk-aware investor who would like to align their portfolio with their long-term goals and objectives this instant (think of this as a lump sum investment). Door number 2 would be for the psychologically-aware investor who would like to eventually align their portfolio with their long-term goals and objectives but understands the regret minimization framework (think of this as dollar cost averaging). The right move depends on the internal make-up of the person or people who have to live with the allocation decision. One of the most important things an investor can do when making these decisions is to write down the reasoning behind whichever route you choose. That way you can focus on the process, not the outcome when markets do whatever they’re going to do down the line. 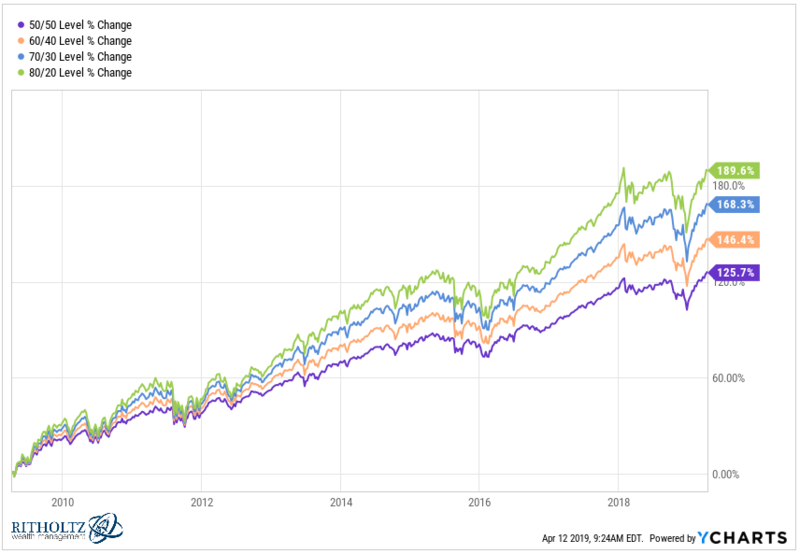 1I’m using the Vanguard 3 Fund portfolio here of the Total US Stock Market Fund, Total International Stock Market Fund, and Total US Bond Market Fund.